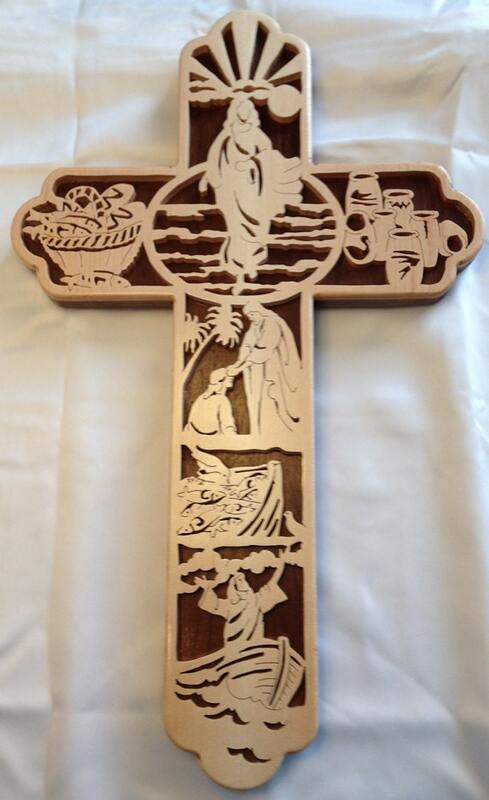 This hand-crafted, scroll saw cross depicts well-known miracles of Christ. The focal point of this cross is Jesus walking on the water. The other depictions are the stilling of the storm, the miraculous catch of fish, the healing of the blind man, the feeding of the five thousand, and the wedding at Cana. The backer is ½” walnut and the overlay is ¼” maple. The cross is approximately 16” H x 10” W. Pattern design by Sue Mey. Beautiful with bumpers on the back for the level hanging.